See the Calendar page for a full listing of all classes, and to check availability and book a space online. 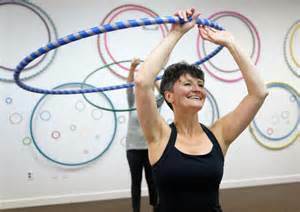 Whether you?ve never been able to keep the hoop going on your waist, or you?ve got that spin down but barely considered that there were other things to do with a hoop, this is the class for you. Discover the toning, balance, coordination and range of motion benefits that are possible when you get to know these pretty circles. This is where you catch the hooping bug.